Following the slightly less conventional biblical epic Noah, Sir Ridley Scott directs Exodus: Gods and Kings - a retelling of the Exodus story that has more in common with the biblical classics of yesteryear than its contemporary predecessor. 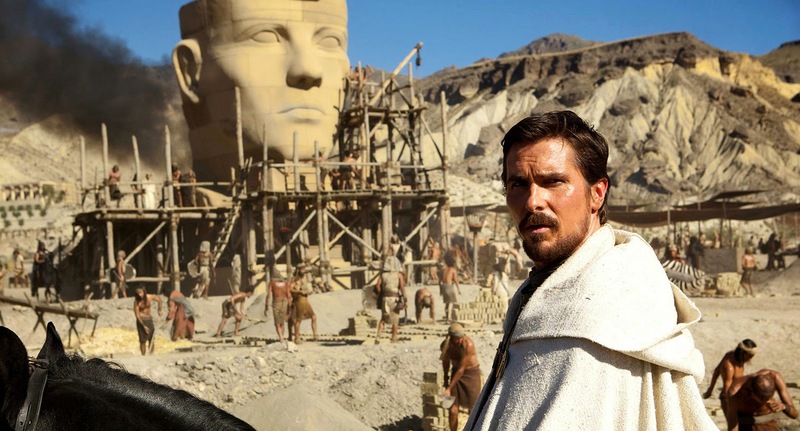 From his life as a prince and elite army general, Moses (Christian Bale) rises up against the Pharaoh Ramses (Joel Edgerton) in an attempt to set 600,000 Jewish slaves free from brutal Egyptian rule. They must survive the gruesome plagues of Egypt first, however. As someone without a religious bone in their body (I've been morally corrupted by far too many celluloid atrocities to redeemed), my knowledge of the Bible comes from Hollywood. This mostly stems from the remarkably appealing all-star Hollywood epics of the fifties and sixties like The Ten Commandments, The Robe, Ben Hur and The Greatest Story Ever Told, which filled the cinemas of yesteryear. Given the often extreme run-times and baggy narratives of these features, plus dwindling public interest, the epic biblical adaptation gradually disappeared. With Exodus, we have a brief return to the grandeur and spectacle of these classic big budget epics, and unsurprisingly one that suffers from the same problems as these pictures. Bale may never be as great a Hollywood figure as the titanic Charlton Heston - who replicated the sheer gravitas, presence and charisma of the Moses figure - yet the actor makes a compelling lead in this grit and grime update. Bale presents us with a Moses equally capable of decapitating an enemy on the battlefield and leading thousands of Jews to the promised land. This updated version of the character feels perfectly fitting for Scott's lavish, spectacle heavy adaptation of the Exodus story. It is this spectacle that makes Exodus worth watching. The gold and cream coloured decadence and grandeur of the Pharaoh's palace, loaded with the sheer visual might of epics such as Cleopatra is astounding - whilst Scott's version of central Egypt and the construction of its greatest landmarks is staggering in scale. The battle scenes are tense, brutal and masterfully choreographed in a similar epic scale to those from Gladiator and Kingdom of Heaven. Although it is the plagues of Egypt that steal much of the glory - from man-eating crocodiles turning the Nile red with blood to swarms of locust ravaging all in sight - with excellent use of 3D, this is a real visual feast. The baggy narrative of Exodus lets it down. Uneven in its pacing, Scott's film has the ability to go from gripping and winsome to completely uninvolving and dull in the space of minutes. Viewer interest is likely to come and go as we shift from highly-charged dramatic scenes, taut battles, or grisly explorations of the plagues to overlong scenes of Moses having a natter with a God - who takes the form of a prissy little English schoolboy. This representation of God would be more likely to scold his mummy for not buying enough cambozola from Waitrose, than serving us as the almighty universal creator. Fortunately there is always an epic sequence or a moment of sheer comedic theatricality around the corner to absorb us. Scott gleeful evokes homage to some of the more excessive and ironic camp that comes with the territory of the biblical epic. Moments of plain old 'too-muchness' add some much enjoyed personality to Exodus, whether it be Ewen Bremner's bizarre appearance as a undeniably Scottish advisor to Ramses or the longing and lingering looks on the battlefield between Moses and Ramses. An abundance of effete aristocrats continue this tradition, most notably Ben Mendelshon's career defining moment as the Viceroy Hegep, who he seems to base on the late, great Frankie Howerd. This high-camp peaks upon Mendelshon's theatrical delivery of the line: "Have I done anything to displease you, and if so, what can I do to please you?" as he looks at Moses's crotch. I'm sure Moses is turning in his hypothetical grave, but I got a laugh out of it. Whilst there are moments of blissful excellence from some of the supporting cast, one of the major issues with Exodus is the squandering of others. Sigourney Weaver may look at the part of Ramses' mother Tuya, yet has literally nothing to do. John Turturro, Aaron Paul and Sir Ben Kingsley feel similarly neglected in their bit parts, especially disappointing when so much time is devoted to Joel Edgerton's miscast turn as Ramses. Your interest may dip at certain moments, but Exodus: Gods and Kings is an impressive watch. It packs few surprises but Scott manages to entertain through the power and scale of his vision.